Because it isn't an easy plant to grow, celery isn't usually found in the home garden. Celery requires cool temperatures, a long growing season and plenty of water, or it can grow to be stringy, dry and less than delicious. However, if you can provide celery with the proper growing conditions, you can harvest plenty of the sweet, crunchy vegetables. Start celery seeds indoors 8 to 10 weeks before the last expected frost in your area. To make planting the tiny celery seeds easier, mix the seeds with a small amount of sand. Fill a planting tray with a mixture of half commercial potting mixture and half peat moss. Scatter the celery seed and sand mixture over the potting mixture, and cover the seeds with no more than 1/8 inch of potting mixture. Place the planting tray in a warm room where it will be exposed to bright, indirect light. Keep the soil damp but not soggy. Thin the celery seedlings when they reach about 2 inches tall. Use fingernail scissors to clip off the smallest seedlings, and keep a few of the sturdiest plant. Transplant the celery seedlings to individual 3-inch containers. Work the soil in your garden three to four weeks before planting the celery. Use a tiller or a hoe to cultivate the soil to a depth of 8 to 10 inches, then work in 2 to 3 inches of manure or compost and an all-purpose granular fertilizer, applied according to the package recommendations. Choose a garden spot in full sunlight. Plant the celery plants outdoors when the temperatures are consistently above 55 degrees Fahrenheit. Hoe shallow rows about 3 feet apart, and plant the celery plants 6 to 8 inches apart in the rows. Keep the soil evenly moist at all times, and don't allow it to dry out. 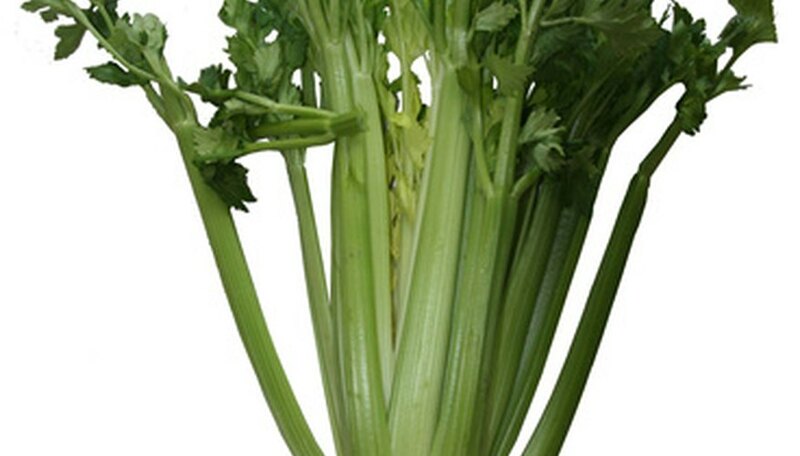 Water the celery generously during warm, dry weather. Keep the area around the celery plants free of weeds. Weeds will compete with the plants for available nutrients and moisture and light. Spread 1 to 2 inches of organic mulch, such as shredded bark, around the celery plants, but don't allow the mulch to pile up on the plants. Mulch will help to keep the ground cool, deter weeds and retain moisture. Harvest the celery when the stalks reach the desired size by cutting the plants off at ground level. If you don't want to harvest the celery all at once, remove a few of the outer stalks as needed, and allow the inner stalks to develop.